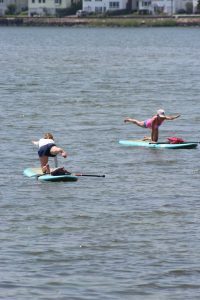 SUP Yoga is a new challenge that will reinvigorate you and push you to become an even better yogi than you thought possible—all while enjoying the natural splendor of floating on water. Take a course here at the Darien Y and see why this amazing class might be your new obsession. Purchase 10 sessions and receive 1 free! *Your instructor for SUP Yoga will greet you in the Front Lobby. Please make sure to arrive 10-15 minutes prior to your class start time. This will allow for time to complete the required waiver, store any personal items, and change into appropriate clothing.